Our bodies have the innate wisdom to heal under the right circumstances; it’s essential to remove those adaptations that can lead to dysfunction or disease. When we get out of alignment, our nervous system is stressed. Things like pain or symptoms are just the body’s way of trying to tell you something isn’t quite right. We want to figure out what the cause is and help bring things back into balance by doing chiropractic adjustments. Before we offer our plan for care, we take the time to listen to you and address the complaint or symptom that brought you into the office. It’s important to understand that all symptoms or pain tie back to one of three major stressors: physical, chemical or emotional. When those areas get out of balance, we’ll seek to find the underlying cause of the symptom —through an examination — and bring things back into balance. Our goal is to help patients understand their bodies better and offer options to help them. We use a variety of chiropractic techniques at Family Chiropractic Center. This allows us to customize care to each individual patient. To complement the chiropractic care offered at the practice, we also provide therapeutic nutrition, functional blood chemistry and exercises. If you’ve never been to a chiropractor before we understand that you may be unsure of what to expect or have some apprehension. We always talk to patients about any concerns they may have in advance of an adjustment. It’s our goal to provide adjustments in the gentlest way possible. 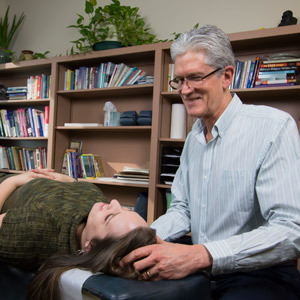 Through our chiropractic care options, we aim to open up the body’s capacity to heal itself. Contact us today to schedule an appointment!